01.14.2007 - I took this photo at a bat control project in Sanford Florida, near where I live and work in Orlando. 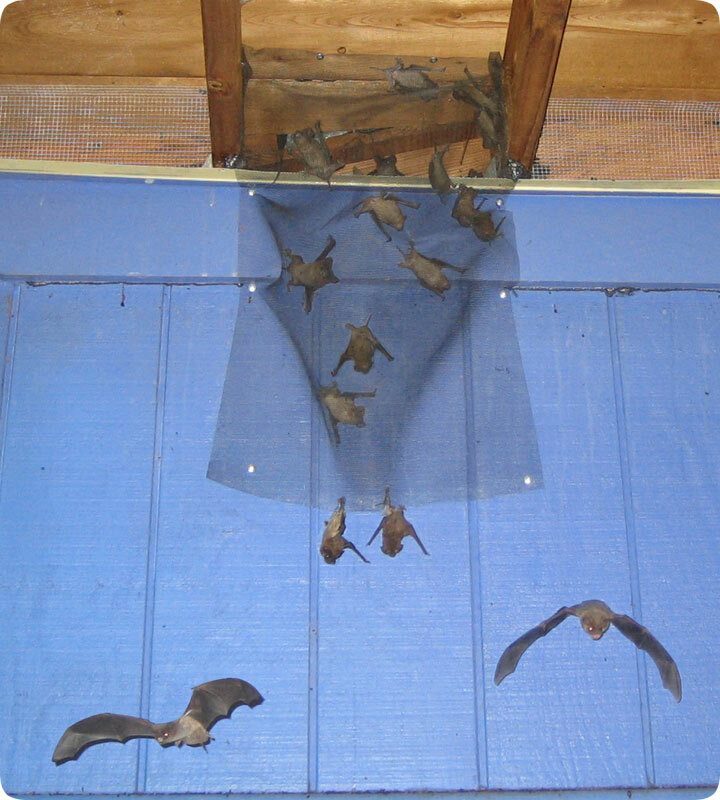 It was a typical case of over 1000 Brazilian (Mexican) Free-Tail bats living in the attic of a building. I had to install steel screens along all of the gaps around the perimeter of the structure. This case was a bit unusual in that the bats were willing to fly in and out of such large gaps. They usually prefer to fly in through tiny gaps, often no more than a half-inch wide. I believe that the reason for this is, and I've never read any corroborating evidence to support this theory, but I believe the reason they prefer to fly into such small spaces is threefold: first, it makes it easier to crawl into the structure - bats are very finicky about how they land - it must be just so, with just the right amount of momentum, and then they crawl in. Second, a small gap may help keep the cavity at a desirably high temperature with low airflow, which they seem to like. Third, they probably know that if they enter through a small hole, they're safer: less chance for a big predator like a rat or a snake or a crow to crawl in and get them. In the above picture, you can see a one-way funnel exclusion screen, which is one of many tools used for bat control depending upon the particular architecture and situation. The bats are able to fly out, but not able to fly back in. High numbers of bats had to make their way out of this building, but once I screened every last hole and excluded them, they were blocked out permanently. Bats are very common in Sanford, FL. This is probably due the the town's proximity to large lakes, Lake Jessup in particular. Lakes mean insects, and bats also need water (the first thing they do when they emerge at dusk is head for water and have a drink.